Tag: domus de janas @en. The tombs of giants, the Domus de Janas, the nuraghes and Phoenician-Punic ruins in the inland of Villasimius make for a magical itinerary. The territory of Villasmius has been inhabited since ancient times: the tombs of giants, the Domus de Janas, the nuraghes and Phoenician-Punic ruins testify to the presence of settlers in several spots along the coast but also inland. Even though the archeological sites are not very well kept and are often surrounded by residential complexes, it is nonetheless possible to trace an itinerary to discover the origins and the traces of the first settlers in this part of Sardinia. The first archeological site that can be visited near Villasimius is the Domus de Janas of Riso Beach. In Sardinian “Domus De Janas” means ‘houses of fairies’; they are pre-Nuragic structures designed for burials. There are two sites, one next to the other, the biggest of which has two cells and a squared access gate. It is located on a promontory behind the Mandorli Village. These ruins have been preserved thanks to the Mediterranean maquis that surrounds them. 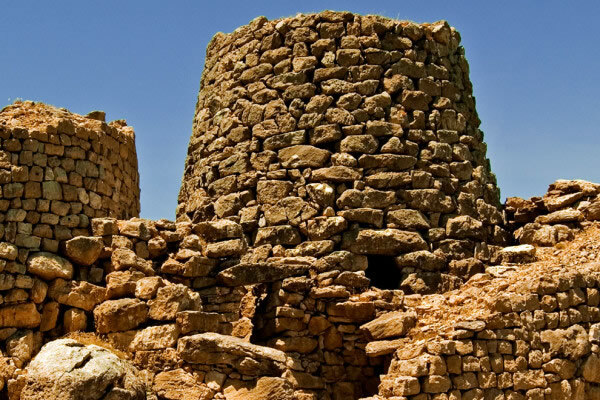 The nuraghe is located in a panoramic location surrounded by nature.